How did Prisoner 4099 start? 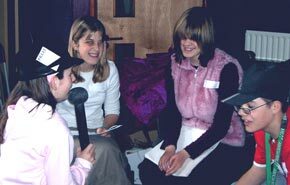 In 2004, Sara Griffiths, Outreach Manager at The National Archives met sixth formers and teaching staff of RNIB New College Worcester. The National Archives wanted to use its historical records to create an exciting project for children and young people. All the young people involved in the project would be blind or partially sighted but they would create a resource for all students to enjoy. The project should be based on real events or people. It should feature exciting aspects of history; for example, campaigns for better rights, criminals, prison life - or all three! The project should feature on the Internet and be accessible to a wide number of people. The National Archives has many documents on rebellion and crime but some of our older documents are difficult to read. Many are handwritten, some are in Latin! We decided to use Victorian records and to feature the project online. This was to be a pioneering project for Learning Curve. It would also be the first time that we had asked young people to create their own resource! Why did we choose a child criminal? The Learning Curve features photographs and criminal records of Victorian child prisoners. Their ragged clothes and miserable faces made us curious. Why had they committed the crime? How had prison affected their lives? The students agreed that it would be interesting to investigate this. The National Archives has a copy of a letter that Oscar Wilde wrote to a newspaper in 1897. He was angry about the unkind treatment he had seen inflicted upon the children in prison. Wilde’s words evoke dramatic scenes. We started to see this project as a play, using one child prisoner as the central character. How did the students research their parts for the project? 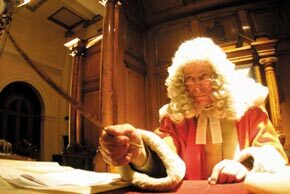 In December 2005, the LOOK youth group made a visit to the National Centre for Citizenship and the Law Galleries of Justice in Nottingham. They attended a hearing in the Victorian courtroom and descended the depths of the original prison cells. They walked in the chilling air of the exercise yard and shuddered in front of the gallows. They also interviewed the costumed guides about what prison life was really like. From January to March 2006, all the students visited The National Archives. We arranged ‘behind the scenes’ tours of the vast repositories where the documents are kept. We talked about our famous documents, ran workshops on Victorian child crime and experimented with document handling sessions. The students also researched the subject during classroom sessions and in their spare time. The performance took place on a Saturday in May at New College Worcester. The play was to be a ‘rehearsed improvisation’. This meant there were to be no scripts; the students would have to create and then remember their parts! Everyone was nervous and excited and we spent the morning practising. We staged the performance in the afternoon. The actors and musician played their parts with great enthusiasm, some of them wearing Victorian costumes. All the LOOK journalists had press hats and carried homemade microphones! The play was recorded and edited by the team at Youthcomm Radio, a Worcester-based radio and online service run for young people, with the help of Worcestershire County Council. The atmosphere was fun but the young people were also determined to do justice to the play and to the characters they had created. After the final scene was recorded, there was a huge outbreak of applause and shouts of joy! Everyone was really excited about what had been achieved. We celebrated with tea and cake and were very grateful that we didn’t have to go to prison, wear Victorian costumes or have bread and water for dinner!